Q I am 35 years old and have had the Mirena IUD for over 3 years with no problems. My periods stopped during that time. My menstrual history is good with regular periods and no problems. My husband and I are ready to have another baby, so I had my Mirena removed. My ObGyn could not find the strings, so I had an ultrasound to locate the IUD. Other than that, removal was uneventful and I haven’t had any spotting and very little discomfort. My doctor, who removed the IUD, said I should wait for 3 cycles before conceiving so my chances of miscarriage would be reduced. I have never read this before and would like a second opinion. I was pregnant the second month we tried with my first child. Being 35 I would like to get started as soon as possible. I am aware of no data suggesting a higher risk of miscarriage if a woman becomes pregnant in the first cycle after Mirena removal.Most clinicians suggest that a woman may try to become pregnant right after Mirena removal, and given your age, this would seem appropriate for you. Mirena or no Mirena, your risk for miscarriage is slightly higher because of your age. 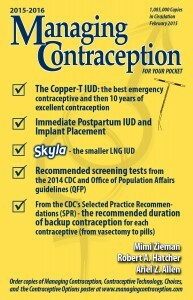 To learn more about the advantages and disadvantages of the Mirena IUD, go to: www.managingcontraception.com. You can order all of these books listed below from our website or by calling 404-875-5001.